Episode 164: "Marks and Recreation"
Intro: Overwhelmed with clients seeking cutie mark guidance, the CMC decide to hold a cutie mark day camp to help several foals at once. Act 1: Rumble attends the day camp only at the insistence of his Wonderbolt brother Thunderlane. Rumble makes no effort at any of the activities and leaves to watch his brother practice flying. He tells the Crusaders he doesn't want a cutie mark. Act 2: Rumble says cutie marks lock a pony into a single activity, but Thunderlane sends him back to camp. Once there he rounds up the other campers to start his own anti-cutie mark camp. Act 3: Rumble forbids his camp to do any activites for fear of getting a cutie mark. The CMC recruit Thunderlane to set up an obstacle course that draws the campers back to the CMC camp, and Thunderlane persuades Rumble back by showing he still has time to cook and still be a Wonderbolt. Character: In my elementary school years and, to a lesser extent, junior high, there was usually one boy in class who was the F student. Maybe he misbehaved, maybe he didn't, but for the most part, he just didn't try and sometimes had a literal zero percent in the class. (This was back in the day when class grades were posted for all to see.) But he'd be quick to tell you how lame the "teacher's pets" were, how futile it was to be smart, and how pointless you were for trying. He'd actively discourage anyone from enjoying school. Fast forward to adulthood, where we read about or encounter people who spout misleading falsehoods or outright nonsense to draw away a following after themselves, alternately undermining or taking advantage of people's desire to do actual good in the world. In theology we call such people heretics, or in politics, demagogues. I'm not proud to say it, but for much of my life, these were the sort of people I just wanted to go away. The deceived we want to redeem, but what of the deceivers? Rumble seems to be in that category, and the writers do a fascinating thing with him, in my judgment, by making him the sort of antagonist we might quickly dismiss, and then probing into the issue he's struggling with. While his "conversion" at the end of the episode is necessarily unrealistically quick, getting into his head gets me thinking about people we too easily write off as the opposition. In fact, one reason I'm happy the World Wide Web came around in my early adulthood is that it gave me an opportunity to associate and discuss with people with opposite perspectives about a lot of things and begin to see how the world looked through their eyes. I know this is a major theme in the series, but this episode hit very close to home for me. 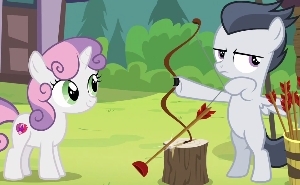 The Cutie Mark Crusaders are remarkably balanced in this episode. There's not just one leader or one idea pony; their day camp project is a good example of teamwork and shared responsiblity: not the focus of the episode, but it's there. Exceptional in this story is that the camp isn't just an ad hoc adventure the Crusaders just run off to. They display a respectable amount of preparation, organization, and thought in what they do. That's even more apparent if you take into account that the events of Fame and Misfortune appear to take place between the conceiving of the idea in the cold open and the sign-up that follows the credits. Sure, there ought to be adult supervision, but when is that not the case for these three? Nevertheless, in the end they do take the almost unprecedented step of going to an adult with their problem, and Thunderlane uses his knowledge of the situation, his adult perspective, and bit of clever persuasion to get the other campers back where they need to be and address Rumble's real issue. I do really like Thunderlane's positive approach to the situation, as opposed to the "because I said so" approach we adults are often tempted to lean on. I also like the fact that these three are mature enough to rein in each other's impulses, most memorably when Sweetie Belle calms the others and then loses her temper in the next scene and has to be pacified by Apple Bloom. That's important because of how personally they take Rumble's rejection of cutie marks. But they're also concerned about Rumble and the other foals personally. To them, the stakes here aren't just the fate of a day camp but ponies being misled as to their destinies. Their weakness is age-appropriate and causes this episode to head in a different direction than it would if one or more of the Mane Six were in focus: Their cutie mark advice and arguments consist largely of slogans and platitudes they've picked up here and there—you might even call them talking points—about how wonderful cutie marks are. They go by what they've heard and been taught, rather than drawing on their own experiences and lessons learned, something we do more readily as we reach adulthood. For example, think back to Call of the Cutie, where Scootaloo defends Apple Bloom's blank flank by speaking of "endless possibilities." The adults in that episode chime in by talking about the thrill of discovering who they are and what they're meant to be, but also say they have "all the time in the world to figure it out." Apple Bloom once dealt with a fear of getting the wrong cutie mark and ending up doing something she didn't like. Luna addressed that fear wonderfully by helping Apple Bloom realize she already knew the answer to her questions. And what does Scootaloo say just before the CMC get their cutie marks? "I don't care if I ever get my cutie mark as long as I get to hang out with my best friends." Finally, in On Your Marks they came to the same realization as Rumble, that getting their cutie marks brings a resolution that actually offers them more time to do other things. And by the way, what of Gabby? My point here is that, if older and wiser, the CMC might have seen that they have some points of agreement with Rumble; there is some logic to his perspective and they've even been where he is, in some ways. From that starting point, they could have an audience to clarify the purpose of cutie marks and have a dialogue. But they're still kids, and so they naturally focus on the antagonism itself. They don't go so far as considering Rumble "the bad guy," but he's the one in the wrong, and so when he actually makes what sounds like a good point, the best they can muster is a battle of contradiction that just pushes him and the other campers away. To their credit, they start off by assuming he's doing his best and deal with him gently until he voices his anti-cutie mark heresy directly. For most of the rest of the episode they're so shocked they really don't know how to respond. Lesson: Surely that's part of the lesson of the episode. But I believe Rumble's situation also reminds the CMC that not everypony gets cutie marks the same way. Everyone needs to grow up, but there's not just one path or timetable for doing so. Toe Tapper got his mark doing what he loved to do, but was scared to do. Kettle Corn gets hers by trying a random new thing like the Crusaders kept futilely doing; it works for her, but she still has a hobby she prefers. My first impression on seeing this episode was what TV Tropes calls a "Fantastic Aesop," a moral that only applies within the universe of the story. We don't have cutie marks in the real world, and I think we all know that luring kids away from day camps is bad. So what are we intended to take from this? It might help if cutie marks were more directly analogous to something we're familiar with. Is refusing a cutie mark a valid choice like going straight into the work force instead of going to college, a questionable choice like going through college without a major and getting a degree in general studies, or a problematic choice like just living off other people and never looking for work? I don't think it's about any of those things. The philosophical question all the ponies are dancing around here is whether life is better with definition, or utterly limitless? The CMC hold an essentialist approach that there's something at your core that is your nature, what you are meant to be, that manifests itself visibly as a cutie mark. Rumble represents the existential idea that you give life your own meaning, and he dismisses the CMC's idea as fatalistic. Your own philosophy probably determines who, as a viewer, you most identified with in this episode. The way cutie marks work in this series definitely supports the CMC's side of the debate, and it's understandable that Rumble finds the unarguably deterministic nature of all this deserving of fear and resentment. For Rumble's part, he learns the lessons of having the courage to swallow his pride, and of being open to new ideas. In a sense, he's accepting reality as he crosses the line in the dirt and takes up his brother's positive perspective. But he's also accepting freedom, because remember, he's put himself in a box by being afraid to do anything but fly to ensure he gets the right cutie mark. And he's accepting balance, realizing that even though some things in his life are imposed from outside, he still has the freedom to find his own place within that, as Thunderlane does by cooking at Wonderbolt headquarters. I believe those are the intended takeaways for this episode. If you want the lesson in one sentence, it's this: Don't be a one-trick pony. I understand the critique that this story misses an opportunity of having the CMC and Rumble find common ground, or of more fairly dealing with the question, "Is it ok not to want a cutie mark?" I think the CMC's failure here is in-character and not a writing problem, but I understand the concern. I'd say I'm about halfway okay with the direction the episode takes. My main issue is with the resulting tone of the story. On both first and repeat viewings, it comes across to me as though Rumble is in the wrong because he has an unacceptable opinion and just needs to fall into line with the conventional wisdom of society. I'm sure that's not intentional on the writer's part; MLP is famous for not taking that approach to its lessons. The fifth season opener, though also one-sided, at least gave good reasons to love cutie marks, based on valuing one another's differences, while this episode presents it more as a matter of conformity. Resonance: This is light comedy for the most part; it's a mild episode. We get little moments of "feels" here and there, such as Apple Bloom realizing her cutie mark work has kept her from some of the things she enjoys. Sweetie Belle tops my list for funniest scene, between her shouting at Rumble and giving a frantic speech to Thunderlane. Some of Rumble's ridiculous references to oppression and tyranny are worth a chuckle or two, especially given the parallels between his character and Starlight Glimmer's. I find it funny that the campers initially do basically the same things at his camp that they were doing with the Crusaders. Kettle Corn wins the award for cuteness here. I'm hoping for another episode with her and her circles. I love her unintentional haikuing, though it's worth pointing out Rumble gets an ironically timed accidental (or sarcastic?) haiku as well. 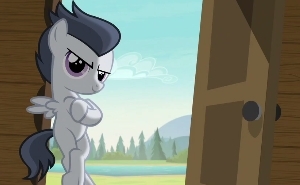 Thunderlane's role in this episode is awesome; he'll fit in well with the rest of the Wonderbolts. Other Impressions and Final Assessment: Rumble's tune is remarkably catchy for a song we're supposed to disagree with. It's one of the better songs of the season, and it makes Rumble a more likeable character just by its musical appeal. Given the story's anti-demagoguery angle, there might be a lesson even in that. I'm surprised to see the term "blank flank" tossed around so casually by the CMC and everypony else. In the past it's been used more or less as the pony equivalent of a slur for late bloomers or kids who are developmentally behind schedule. There must be a more neutral term for ponies who haven't acquired their marks yet. 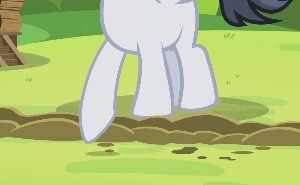 And I'll just say once again that the cutie mark area is not the flank of a pony, it's the hindquarters. I enjoy this one, I really do. The CMC impress by showing themselves mature, capable, and generally encouraging, but with plenty of room to grow. The lesson isn't a simplistic do this/don't do that but an identity question that gets into some deep philosophical territory. If this review sounds negative, it's because the good things about the story are fairly straightforward while the couple of issues I have with the presentation just take awhile to talk about. In that regard, it's very similar in quality to On Your Marks! and It Isn't the Mane Thing About You. All things considered, while still a pretty good episode, I think Marks and Recreation falls a smidgeon short of the show's overall standard.